I am going to go ahead and create this. For Wes, I was hoping that Invest 90L would hold off but it looks like it might actually become a named storm. And with that, I present you with a Spaghetti Model. will be issued by 800 PM EDT this evening. 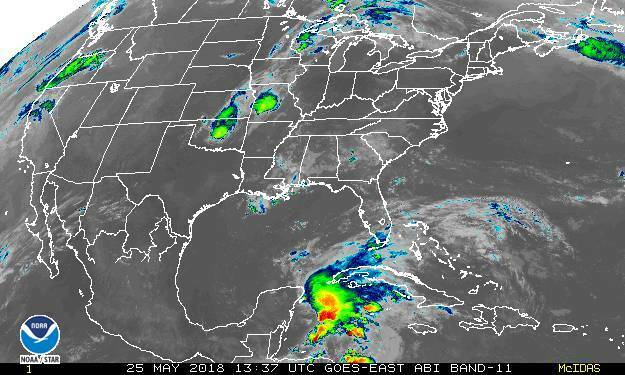 Per visible, A little bit of a spin already around Cozumel. 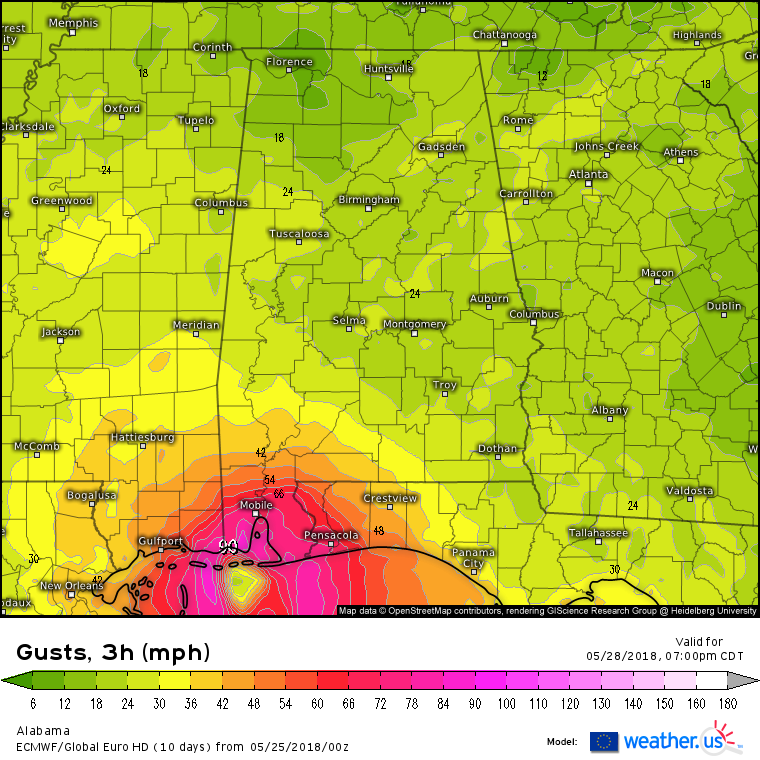 Pretty good consensus for landfall on the Mississippi/Alabama coasts. Euro is a solid category 1 hurricane. Trough orientation helps with outflow as it approaches and slows down along the Gulf Coast. Below are forecast 10m wind gusts...pretty impressive. over the Memorial Day weekend. Most of the models have this becoming a tropical storm. I wouldn't say though that a Cat 1 is out of the question. Its going to be a busy couple of days in the weather forecasting offices around the coast. If it continues to Strengthen. I see it becoming Alberto at the next update. 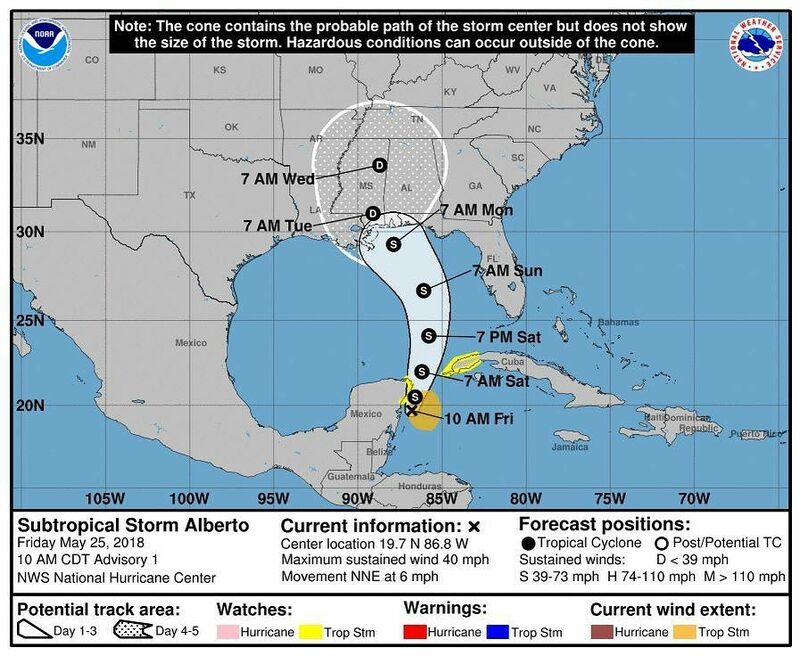 We have Subtropical Storm Alberto. Feel free to update the thread title. This could end up being quite the tornado producer. Betting we divert to Costa Maya on the western side of the of the Yucatan. I’m making full use of the ships facilities to prepare for Alberto’s arrival. More to come soon. That current track is trouble for NOLA. That's the classic track to funnel water right up into the metro, even if its not a particularly strong system. Could be a significant flooding risk there even if storm surge is relatively weak. I just saw something on the EURO that was pretty crazy in regards to this potential threat. The latest NAM is a very odd angle of approach that I think has only been done by the big 1947 hurricane. That wrecked a lot of the city of New Orleans. Surge and rainfall will be a big problem with this system as it slows and meander a while along the Northern Gulf Coast. Would the proximity to the Upper Low help enhance the tornado threat?